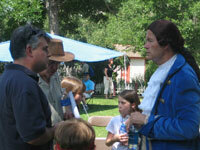 I'm writing in praise of your reenactment of Thomas Jefferson. In addition to dressing the part to help give a sense of the times in fashion, you clearly explained the history of the Declaration of Independence, Constitution and the Bill of Rights from the perspective of Thomas Jefferson. Your call to action at the conclusion of the presentation to protect those rights was an excellent tie in to our students' current unit of study on citizens' rights. Furthermore, while presenting, your delivery of pertinent vocabulary and information was excellent. As oppose to shying away from unfamiliar words that students might not know, you used and defined them in a natural manner. Your analogy of comparing the Constitution and Declaration of Independence to the spine and flesh helped make it relatable to students as did your discussion of cliques to why Thomas Jefferson felt the presidency should not be termless. We look forward to having you return to Brown International in the future and appreciate your efforts to make the presentation engaging and informative for students. I just wanted to send you a belated thank you for the amazing presentation at The Center for Urban Education, University of Norther Colorado in September. It was a great way to end a wonderful week of HISTORY social studies methods class. You modeled methods that validated and confirmed everything we discussed during the week...passion for the topic, story weaving, and student interaction. They now have a clear understanding of how to make history come alive! Please consider presenting to my students again next fall. Wow, my students loved your presentation at Regis University on Tuesday! They shared their excitement by stating, "We wish we would have had him speak to us when we were in elementary or middle school! It would have made that time period more meaningful to us." Thank you for helping me drive home, to these education students, the importance of stepping into the shoes, literally, of historic people and their time periods. You are awesome. Please consider sharing your expertise and passion again next fall! I would like to take the opportunity to praise the work of Rev. Jack Van Ens. Jack recently came to present a workshop for my 11th grade classes on the Young Chautauqua Project. He came in the persona of Thomas Jefferson, and kept my students entranced. Over the course of several weeks, Jack came to our class to help my students with their research and performances for their own Chautauqua speeches. Jack was also kind enough to give a copy of his book, How Jefferson Made the Best of Bad Messes to each and every student in my class, free of charge. He donated 63 books in all. In later discussions with students, they unanimously praised Jack for both his assistance and his encouragement in helping them improve their presentations. On behalf of myself and my students, I would like to thank Jack for his generosity and kindness in donating not only his books, but also his time, enthusiasm, and expertise to my students. I would like to thank you for coming to share your rendition of Thomas Jefferson with our fifth and sixth grade students on April 10, 2012. Your story telling ability held the student and teachers attention as you told us about the different stages of Thomas Jefferson's life. It was so exciting to see the looks on their faces as they listened to the story. I know that our students could relate to your presentation because they study the Colonial time period in fifth grade. This year our fifth grade teachers and students had a Colonial day where they acted out a day in the life of a Colonial student. They dressed in Colonial attire, made butter, wrote with quills and learned dances from that time period. Your presentation added another layer of background knowledge for them. I have asked the students to write letters to you to thank you for your visit. As I read through them the main ideas of your talk resonated throughout their writing: "READ, READ, READ, WRITE, WRITE, WRITE, STUDY, STUDY, STUDY". I have enclosed their letters for you to enjoy. Thanks again for helping History come alive. Interesting, entertaining, funny, energetic. These are a few of the words used by my students to describe Mr. Jack Van Ens and his presentation of Thomas Jefferson. I invited Mr. Van Ens to present Thomas Jefferson to our 5th grade classes on March 26, 2012. 1 also asked him to speak to a smaller group of students about how to give a first person presentation. He far exceeded my expectations. Not only did the students learn interesting facts and stories as he brought Jefferson to life, they also learned skills needed to bring any character life. He taught them how to create the ... "verbal portraits to hang on the mind's picture gallery." Upon reflecting on this visit my students valued and appreciated that Mr. Van Ens, 'interacted' with them; 'when he saw that kids didn't get something he explained it,' and 'he answered the tough questions' instead of brushing them off. I would highly recommend Jack Van Ens as a presenter for any group. His obvious experience and understanding of students allows him to be a passionate presenter who educates as well as entertains his audience. I would like to express my gratitude for your wonderful Thomas Jefferson Program. All of the staff and volunteers here at Hiwan Homestead Museum and the Jefferson County Historical Society were extremely excited about hosting you here in Evergreen, in honor of Presidents' Day! Your program was amazing—insightful and entertaining. Our guests were thrilled with your portrayal, and I wouldn't hesitate to recommend any of your offerings to anybody interested in history. Thank you so much for coming to Evergreen! I hope that we'll be able to get you on our schedule again soon! I recommend a visit from Thomas Jefferson to anyone interested in bringing a thoughtful historical perspective to any contemporary issue. Having worked with Jack Van Ens as a colleague and watching his direct impact on students and audiences for many years, I have seen firsthand his unique gift for not only bringing Jefferson to life, but more importantly, his talent for bringing to life the core issues that Jefferson faced and which we still wrestle with today. He takes on questions of virtue, of the role and limits of government, the balance between freedom and responsibility, and how we can best tend to the fragile needs of our communities. One part performance, one part history lesson, one part Socratic seminar, a visit from Mr. Jefferson is an invitation to engage any group in a dialogue with one of the most famous Americans about what democratic citizenship truly means. considered a conflicted individual would thoroughly enjoy this presentation. African American and has spent his life working towards peace and justice in the Freedom Movement. getting the audience to travel back in time and see the world as it was during Jefferson's life. religion during colonial times compared to how far our world has come. because he remains in character throughout, his presentations are very thought provoking and engaging. education to an othervuise fypical awards banquet. Thanks for giving my Silver Sneakers group so much enjoyment and food for thought. The way you presented Thomas Jefferson was most creative. Since you couldn't possibly deal with all his accomplishments in such a short amount of time, you opened windows on his thinking which we can continue to pursue. Mr. Jefferson was first and foremost a thinker. I never knew you were in Paris when the Constitution was signed. I agree that a President should not be President for life because they will be just like a king demanding power over everybody, and you guys went to America to be independent from the king... Down with King George! Thank you for coming to our school and for spending your time with us to talk about yourself. It was interesting to know that you studied 12 hours a day. If I tried to do that, I would blow up! 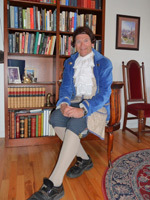 Jefferson was brought to life by Dr. Jack Van Ens, a member of Colorado's Civic Canopy-Presenting in the Chautauqua style, Jack achieved the uncanny sense of Jefferson's presence through the well studied knowledge and characterization of Jefferson and his times. His portrayal captured the passion, poise, and humanity of this important historic figure. I have been a Rotarian for 18 years and never saw a speaker get a standing ovation. What an excellent presentation! Thank you so much for sharing your knowledge with us. The Rotary District has a website where Program Chairs share information on excellent speakers. I have taken the liberty of posting your information there. I have also forwarded your information to two school principals since you mentioned in closing that you also love to speak to students about values, etc. Thomas Jefferson, also known as Jack VanEns, visited our fifth/sixth grade classroom this week. It was both a delightful and profitable visit. It was apparent Jack VanEns has an extensive knowledge of the Founding Fathers, and in particular, Thomas Jefferson. He was able to tell the children about Jefferson, relating facts and anecdotes appropriate for their age and understanding. However, Mr. VanEns gave the children much more than role playing Jefferson. Explaining Jefferson's passion for reading, he talked to the children about the value of reading and treasuring books. It was a powerful lesson as they learned how one can become rich through reading. With his velvet coat, silk stockings and wig, Mr. VanEns presented an authentic Thomas Jefferson. He engaged the children for a full hour, giving the students the gift of a better understanding of our history and the charge to value reading. 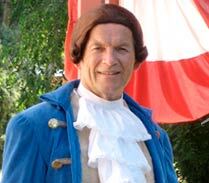 I salute Jack VanEns' portrayal of Thomas Jefferson and highly recommend him to school groups and civic organizations! As part of Princeton Theological Seminary's bicentennial celebrations, I invited Dr. Jack R. Van Ens of CREATIVE GROWTH Ministries to portray Jonathan Edwards for us in Miller Chapel. I have to say that in a highly successful bicentennial celebration, this was one of the jewels. I have always maintained that Dr. Van Ens has an eighteenth-century face. His portrayal of Edwards was breathtaking and transformative. This was not a reenactment in 18th century dress, but somehow captured both the piety and the strength of Edwards. We were not treated to a recitation but to an active engagement with matters of faith from Edwards' perspective. The audience was intrigued and joined in, asking questions and Dr. Van Ens responded, transposing Edwards' thought and perspectives to today. I can recommend Dr. Van Ens without hesitation. Princeton, of course, is where Edwards died and is buried and we feel we have particular links to him. I wish we had done this before and I would gladly do it again. I am truly grateful for such an unusual and thoughtful gift. Your ministry as Jonathan Edwards during the AWAKENING AMERICA SUMMIT in Northampton, MA was exceptional. It simply would not have been the same without you. Thank you again for excellent work and wonderful spirit. You were a joy to work with. I think your concluding piece on the sermon “Sinners in the Hands of an Angry God” and connecting it to the contemporary situation was your best moment of all. I was personally blessed and enriched. I also appreciated your sharing the 9/11 account from the pictures taken of this tragedy since it tied in well with the Cry Out America prayer gathering across America. I wasn’t sure if this was providential or intentional, bit it was effective. 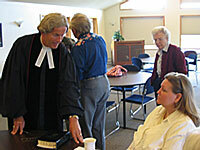 Your portrayal of the person of Jonathan Edwards at the Princeton Theological Seminary Reunion Week 2012 was exceptional! The Journey between Mind and Heart—A Visit from Jonathan Edwards was a journey for each of us into the days of the early 1800’s when such heady ideas as country formation, the role of faith and learning, and the balance between reason and revelation were part of the national leadership discussion. The gathered alumni/ae of Princeton heard not only great history, but wonderful humor. We received a glimpse of the times, and were regaled with stories that well-illustrated the life of Mr. Edwards. When it was time for questions from the audience, I was spell-bound as you not only kept in character, but actually answered the questions with stories of the times! Good use of drama and costume to reinforce the message. Thank you for giving a different dimension to our reunion week activities. God bless you in your reminders to others that history is not only important but interesting—even delightful. Jack did an absolutely splendid job of at once teaching us about Jonathan Edwards and giving us a strong message from Scripture. He preached at three worship services, and he was well received; in fact, I didn't hear one negative comment, but instead heard all kinds of positive comments. That night Jack came back and carried on a debate between Thomas Jefferson and Jonathan Edwards that addressed such topics as the meaning of Christianity within the relationship between church and state. In some ways I found this to be even more impressive because he presented the views of both of these men so clearly. Jack was also very effective in answering the questions that were posed to both Jefferson and Edwards." I was awed at how well you took on the manner and character of Jonathan Edwards- as you shared his thoughts and ideas. This certainly took a great deal of time to study his works and his philosophy as you prepared. You have a certain intelligence and awareness that very few people possess. Thanks for making this effort to help us improve the atmosphere in our meetings. I look forward to future opportunities to seeing and hearing you in your other roles as you serve your ministry with Creative Growth Ministries. I hope all goes well and that others are willing to include you in their worship services or meetings as it is appropriate. I write to thank you for your participation in last week's assembly workshop "Our Story, Our Future." I could not have "asked or imagined" the success it achieved. Holding up our history in a knowledgeable and winsome way while demonstrating its relevance and importance to our future direction was a daunting challenge. I believe that objective was achieved effectively, both in the individual presentations and through the workshop as a whole. Your presentation brought Jonathan Edwards to us not as an "outsider" but as someone who was intimately familiar with Calvin, its history, its characters. The result was a stirring and at the same time personal and affectionate call to us to look away from ourselves to God and be thankful. Edwards was a giant but he was also human and we were given glimpses into both. Thank you.